A rendering from BNIM shows the Central Street view of the YMCA's planned addition behind the historic Lyric Theatre building at 11th and Central in downtown Kansas City. 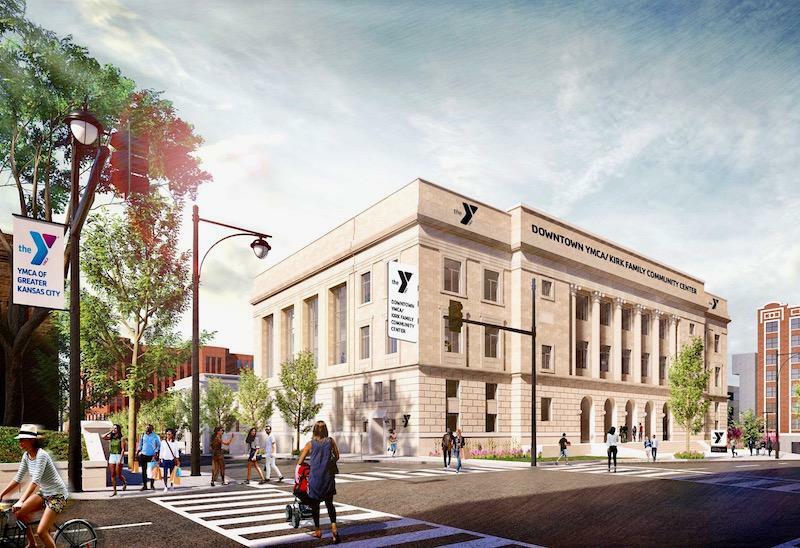 A new downtown YMCA, a huge civic endeavor in the making for seven years, is scheduled to begin construction Friday in the former Lyric Theater building. Completion is expected in spring 2021. The $35 million Y will incorporate the front facade and lobby of the historic theater at 1029 Central and build a 42,000 square-foot addition behind it, bringing to downtown a host of health-related activities including a family pool and lap pool, medical clinic, gymnasium and suspended indoor track. It marks the return of a major YMCA to downtown Kansas City after a 37-year break. The old downtown Y at 10th and Oak closed in 1981 after operating there since 1907. The seven-story building was demolished in 1999 to make way for Ilus W. Davis Park. “The new Y builds on the success of Kansas City’s downtown revitalization, and will bring much-needed community programs to this diverse and growing community,” David Byrd, president and CEO of the YMCA of Greater Kansas City, said in a statement. The planned downtown YMCA will retain the front facade of the Lyric Theatre and build an addition behind it. The Y has operated a 20,000-square-foot facility in downtown's Quality Hill neighborhood since 1989, but it’s geared toward adult fitness activities. Byrd took over the Greater Kansas City YMCA in 2010 after coming from Nashville, where he helped that city expand its downtown Y. In December 2011, Byrd laid out a vision for a 100,000 square-foot downtown Y here that would be an anchor for all facets of community health: exercise, health facilities, a pre-school and other amenities. At the time, he hoped to have it done by 2016. Kirk, whose savvy as a real estate strategic thinker helped DST become a major downtown employer and player in its overall revitalization, helped early on, identifying sites and financing tools. Several downtown sites were considered before the Lyric was chosen in March 2014. It had lost its major tenants, the Kansas City Symphony and the Lyric Opera, when the Kauffman Center opened in 2011. Kirk's vision of using revenues from an existing 11th Street Corridor Tax Increment Financing District remained a key part of the project financing. The Downtown Council also spearheaded the development. Ultimately, renovation and construction of the 62,000 square-foot project is being funded by $16.9 million in TIF financing, $4 million in state tax credits and substantial additional private contributions from foundations and individuals. The Y will be named the Kirk Family Community Center in honor of Phil Kirk. The historic Lyric Theatre building has been vacant since the Kansas City Symphony and the Lyric Opera moved to the Kauffman Center in 2011. “This is a new chapter in history for our Y and for Kansas City as we transform the historic Lyric Theatre building into a community center that will benefit generations to come,” Byrd said in his statement. The facility will include three community rooms, including one that will feature a teaching kitchen to instruct people on healthy eating and nutrition; a Kids Zone play area; an indoor family pool and lap pool for exercise and swimming lessons; a gym; a large health and wellness area offering cardiovascular and strength training with the latest equipment; three studios for group exercise; and a suspended indoor walking and jogging track that will offer views of the lower level of the center. In addition, Truman Medical Center will operate a clinic at the new facility. Services will be available to Y members and others in the surrounding area. Cerner also is partnering to bring advanced technology to its patient services, according to the release. “We are excited about the construction of this new University Health clinic, because it’s in the right place at the right time,” Charlie Shields, president and CEO of Truman Medical Center, said in a statement. Design and construction partners include BNIM Architects, J.E. 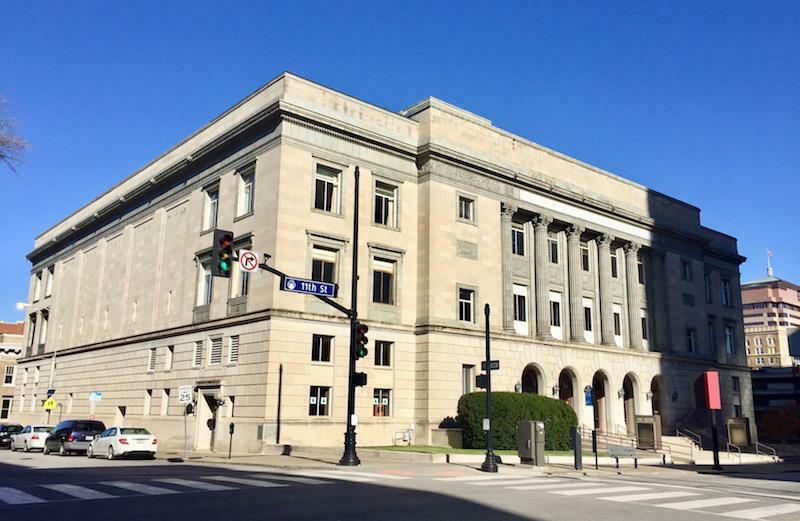 Dunn Construction, Structural Engineering Associates, Henderson Engineers, Antella, Taliaferro & Browne, New Horizons, Land3 Studio, Larkin and FSC. The design of the addition will include limestone from the quarry that supplied stone to the original Lyric. Dramatic, two-story windows will be inserted along Central Street to bring in natural light and provide a contemporary look to the exterior. In addition to the Downtown Council, development partners are Broadway Square Partners and MC Realty. CitySceneKC / EJ Holtze Corp.
A $63 million boutique hotel that backers say would be the most luxurious in the metro is being proposed across Wyandotte Street from the Kauffman Center for the Performing Arts. A $95 million redevelopment plan for the former Kansas City Star property that includes renovating the historic structure and building a boutique grocery store and marketplace above a 500-space underground garage has cleared its first hurdles at City Hall. The full Kansas City Council on Thursday approved an ambitious plan from developer Vincent Bryant, who told a council committee Wednesday morning that he wanted to make the former Star campus the economic center of the Crossroads area.